Medan anchovy is one of the best Indonesian anchovy. It provides great textures, fresh flatting white coloured, and also grat taste for any home cooking. Anchovy is a group of small sea fish Engraulidae family members. This name covers a variety of fish with a silver body color greenish or bluish. I was cooked with sambal sauce and eaten together with warm rice . 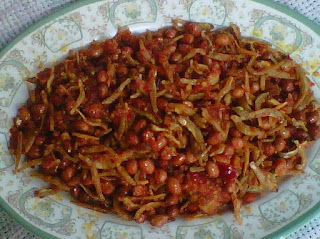 Let's start cooking with Medan Anchovy. Mix anchovy and fried peanuts into fried seasoning and stir slowly. Add salt and granulated sugar as you like.